Exit bear, pursued by an actor. 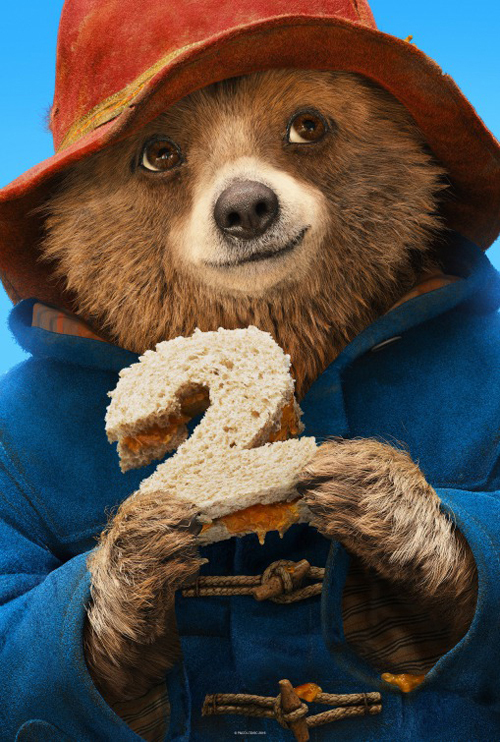 (SPOILERS) Paddington 2 is every bit as upbeat and well-meaning as its predecessor. It also has more money thrown at it, a much better villain (an infinitely better villain) and, in terms of plotting, is more developed, offering greater variety and a more satisfying structure. Additionally, crucially, it succeeds in offering continued emotional heft and heart to the Peruvian bear’s further adventures. It isn’t, however, quite as funny. Even suggesting such a thing sounds curmudgeonly, given the universal applause greeting the movie, but I say that having revisited the original a couple of days prior and found myself enjoying it even more than on first viewing. Writer-director Paul King and co-writer Simon Farnaby introduce a highly impressive array of set-ups with huge potential to milk their absurdity to comic ends, but don’t so much squander as frequently leave them undertapped. 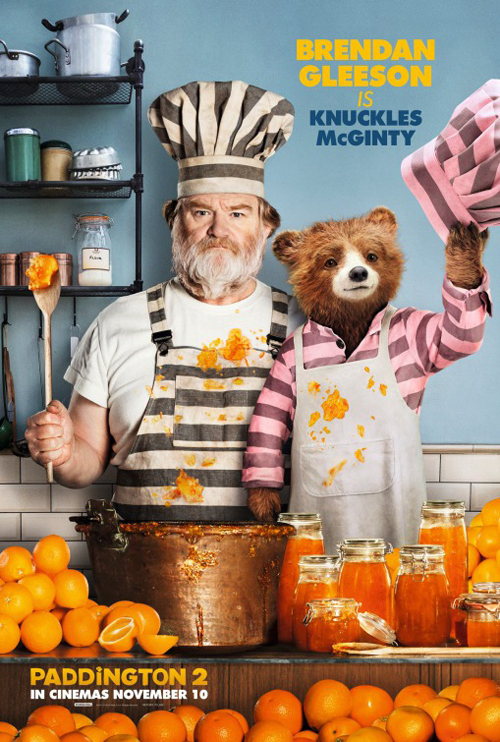 Paddington’s succession of odd jobs don’t quite escalate as uproariously as they might, his messy encounter with the fearsome Knuckles (Brendan Gleeson) isn’t drawn out quite long enough before the latter becomes his protector (albeit Knuckles remains pleasingly gruff for longer), an incident with Buchanan dressed as a nun (featuring the returning Farnaby, running with a classic British comedy riff as he is once again infatuated by a man in drag: “Stop the stunning sister!”) speeds by too quickly, and the sequence in which Buchanan discovers Mr and Mrs Brown in his house needed an ever so slightly more outlandish explanation for their presence to knock it out of the park. Compared to the Brown household mishaps in the first movie, the inspired chase involving a skateboard and a policeman’s helmet, Mr Brown (Hugh Bonneville) dressed as a cleaning lady, or the marvellous use of the over-used Mission: Impossible theme (or even just the burst of Hello when Peter Capaldi’s Mr Curry first claps eyes on Nicole Kidman), and the sequel is more jackdaw but less sustained in its hilarity. This time round, rather than a dedicated taxidermist, a pop-up book holding a treasure map fuels the plot, although really, it’s simply about the little bear spreading his values of openness, honesty, politeness, inclusivity and marmalade to all he meets, and touching even the hardest of hearts with his uncommon genuineness. This aspect can’t be faulted, unless you take objection to the Harry Potter-by-way-of-Richard Curtis presentation (or, as King puts it “Mary Poppins-like”): the tourist’s dream of a cosy, beatific, perpetually cheery London. There are a few teething issues, truth be told; the first quarter of an hour is content to amble in the otherwise risky manner of a picture that knows it has a captive sequel audience, and the flashback detailing how it was Paddington came to be adopted by his aunt and uncle is only necessary to those who assume people go to follow-ups without first seeing the original. But once King gets underway, he keeps us thoroughly diverted until the final act, at which point he ratchets the pace – and tension – up a gear for an all-out duelling train chase. His greatest achievement is how much we care for the CGI bear, though. Indeed, the chase culminates in a sequence rivalling any tearjerker for pathos, whereby Paddington looks set to succumb to a watery grave. Ben Wishaw’s contribution to the success of these movies can’t be understated either, giving voice to a gentle, unaffected bear who always puts others first, but it’s in the supporting players that these pictures flourish their colour. 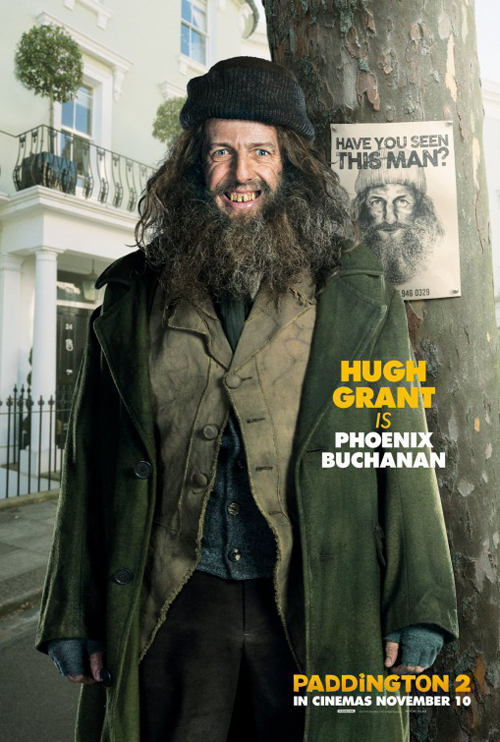 And top of the pack is Hugh Grant. The only disappointment of Grant’s performance is that his best scene is left until the closing credits (a show-stopping, behind-bars musical performance that goes down a storm). He’s reminding us throughout, for any who refused to pay attention over the last two decades, what a talented comedic actor he is. Buchanan, a vain, washed-up thesp reduced to doing dog food commercials (dressed as a dog, eating dog food), sees the chance to produce a frightful-sounding one-man show (“An evening of monologue and song”) with the loot the pop-up book leads to, and pulls out every dastardly stop to achieve his goal, and a succession of goofy disguises and accents. Grant switches from ingratiating charm to gleeful villainy with utmost ease, and also does a better ham Poirot than Sir Ken (and let’s face it, ham Poirot is the way you want your Poirot), as well as walking atop a (moving) train more convincingly than Sir Ken. There’s great enjoyment to be had from his hack actor dropping in of references to theatrical luminaries (“Larry”) and a succession of Shakespeare quotes (“Screw your courage to the sticking place”) and misquotes (“Exit bear, pursued by actor”. Well, mis-stage directions). Possibly even surpassing Grant is Gleeson, who fits the cartoonishly foreboding prison like a big hairy glove. It’s with Knuckles that the picture’s redemption arc resides; he’s effectively required to accept Paddington and ultimately be his champion and rescuer much in the manner of Mr Brown in the original, a change of heart you can see half an hour off but which is no less satisfying for that when it comes. King is clearly having the most fun in this setting, transforming stir into a pleasant, pink-fatigued, plant-strewn patisserie off the back of Paddington’s mood-alerting menu for marmalade. The New Statesman would have you believe Paddington 2 forwards a “welcome anti-Brexit message” (it must be a terrible burden to get your jollies from enthusing over the perceived politicisation of family movies – provided they fit your own political perspective, naturally) on the basis of Buchanan hating working with others, so it’s gratifying that King and Farnaby nursed no such intent, instead namechecking Capra – suitably as the picture feels like it comes from a different era – while getting in a dig at Star Wars along the way (“The need for kindness transcends all political debates…. 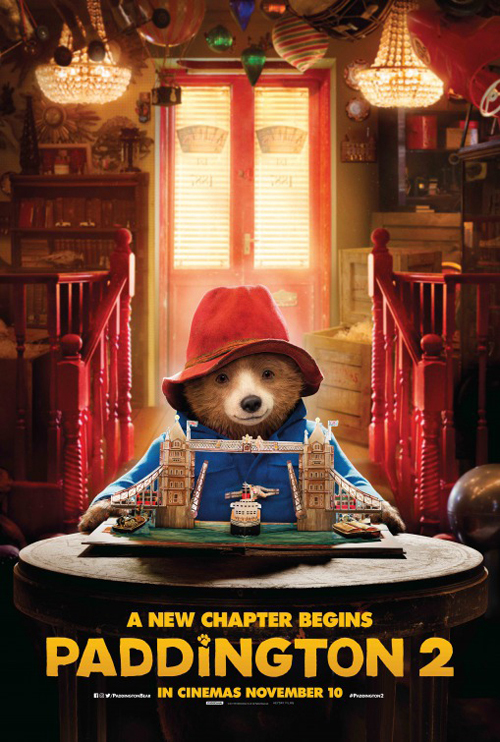 I think Paddington is about seeing the good in everyone, and trying to break any of those deadlocks”). In expanding the cast and canvas, the regulars aren’t quite enabled to make the most of plot threads introduced and subsequently resolved with nothing in between. The kids are now difficult teenagers and not quite as effective (J-Dog, indeed), while Bonneville continues to tap his flair for comedy as Mr Brown, just not quite as productively this time; occasionally, a recurring gag is on the lazy side (Henry’s biker days). Occasionally, even when it’s lazy, it’s still very funny (his meditation practice coming in handy while stretched amid two speeding trains). Sally Hawkins is ever adorable as Mary Brown, but where before she was Paddington’s empathically ardent supporter, now the whole family are. Julie Waters is a national treasure at this point, so immune to criticism, obviously, but as I mentioned in my review of the original, I much preferred her in slightly mental mode as Harry Hill’s nan. She does deliver of the best lines, however, warning, without winking, that “Actors are the most evil people on the planet”. 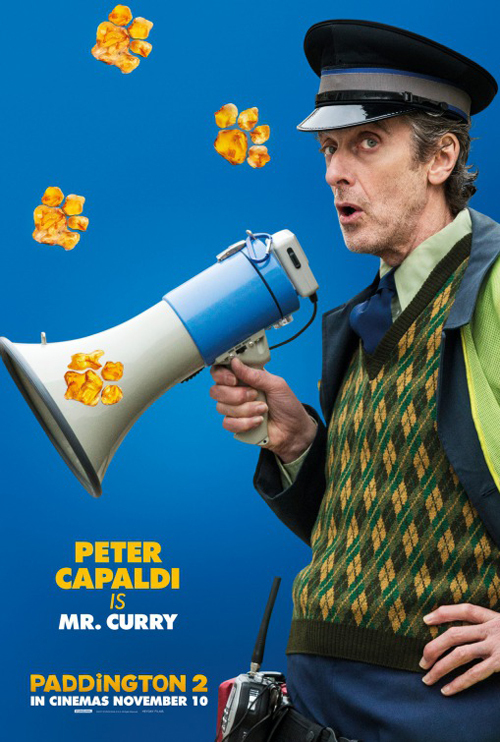 Other notables in the cast include Tom Conti as a cantankerous judge – understandably so, given what Paddington did to his hair – put in his place by an exasperated wife, Joanna Lumley as Buchanan’s agent, required to deliver an old (but amusing) “Nice buns” riff, and Richard Ayoade offering expert testimony on marmalade. Wolfie, the dog Paddington initially gives chase to Buchanan on also turns in a fine performance, although it did set me wondering, in Pluto and Odie fashion, why some of the animal kingdom can speak and not others. Dario Marianelli’s score wallows in poignancy more than Nick Urata’s original, reflecting the slightly less irreverent tone. Erik Wilson ensures the visuals pop (his distinctive lensing was also brought to bear on Ayoade’s directorial efforts), but most of all, King shows himself to be one of those rare TV directors – and even rarer TV comedy directors, step forward also Edgar Wright – with genuine cinematic flair. Paddington 2 looks great, a step up even on the impressive original, and King’s as comfortable staging an elaborate, expertly-martialled train chase as a flamboyant musical number. I’ve seen him compared to Wes Anderson, but much as I love Anderson’s work, that really only applies to his talent for the tableau; King’s otherwise for more kinetic in sensibility. Indeed, I’d love to see him take a crack at a more faithful Fantastic Mr Fox; I’m sure he’d do it justice. Perhaps after Paddington 3. We don’t want to offend the effendi. Maybe I should spend less time at the cemetery. Hercule Poirot. I do not slay the lions. Too much gossip below stairs, Steed!